Menopause One Multivitamin provides comprehensive daily nutrition for menopausal women in just one tablet a day. Specially blended super foods, essential nutrients and botanicals nourish and promote relief of menopausal symptoms. Menopause One is iron-free, gluten-free, sugar-free, lactose-free, dairy-free, wheat-free and yeast-free. It is 100% natural and contains no artificial colors, flavors, sweeteners, preservatives or additives. Plant-source enzymes ease digestion, making it gentle on the stomach. Other Ingredients: (natural mineral or vegetable source): microcrystalline cellulose, stearic acid, modified cellulose, magnesium stearate, silica. Coating: dextrin, dextrose, soy lecithin, carboxy methyl cellulose, sodium citrate. Exact ingredient amounts for these items is not provided in the product source. 1 tablet per day between meals. $16.99 for a 30 tablet bottle, $38.99 for a 90 tablet bottle. Free shipping is available for large orders. The vendor offers a product return – money back guarantee policy as well as a customer service contact number and an on line feature to use to send email messages to the vendor. The product source does not include any product testimonials. This product is moderately priced and the vendor offers a reasonable product return policy as well as contact phone number. Even so anyone considering purchasing this product may want a health services professional to review product information and the product’s large number of ingredients prior to purchase. 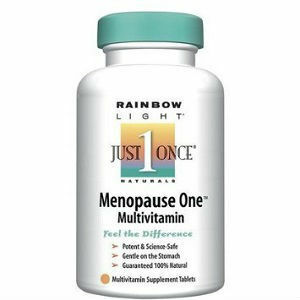 Jackie Horowitz	reviewed Menopause One Multivitamin	on May 4th	 and gave it a rating of 2.